To Missoula residents, open space is more than just accessible woodlands, rivers and trails. It’s about leaving a legacy for future generations, Missoula County Commissioner Dave Strohmaier said Wednesday, launching the campaign for November’s $15 million open space bond vote. 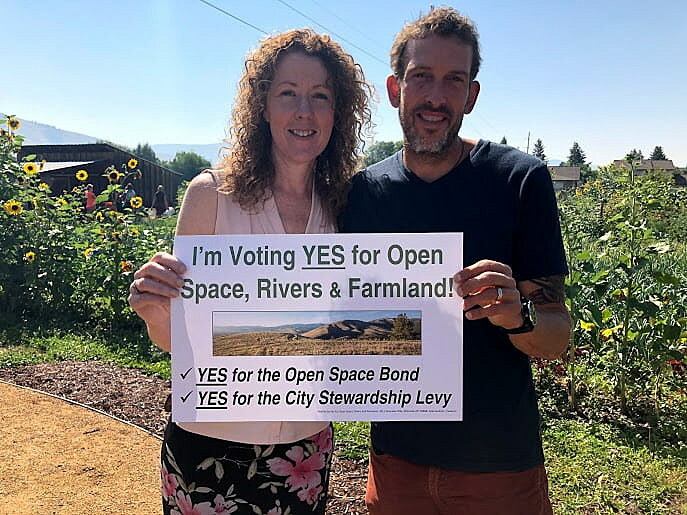 Garden City Harvest, Yes for Open Space, Rivers and Farmland and other organizations hosted a campaign launch Wednesday to show support for the proposed countywide open space conservation bond and a $500,000 city stewardship levy. Both will appear on November’s general election ballot. The $15 million bond will be used for the conservation and acquisition of open spaces, river access and farmland countywide, while the $500,000 mill levy will allow for ongoing funding to maintain already purchased conservation lands in the city of Missoula. The new bond could advance the recently adopted Community Wildfire Protection Plan by reducing development on forested land, improve access to the Clark Fork River from downtown Missoula to Frenchtown, and protect ranches and farming operations from development. Garden City Harvest hosted the campaign kickoff, with Jean Zosel, executive director of the 3.5-acre farm in the heart of Missoula, saying that it wouldn’t have been created without the 2006 open space bond. The farm grows about 35,000 pounds of food per year that is used by the Poverello Center and other local organizations and families, and provides 55 community garden plots used by locals. The 2006 bond funds also extended the Milwaukee and Grant Creek trails and opened access to public land in Potomac. The Barmeyer Trail on Mount Dean Stone is now open to residents because of the 2006 bond and the new bond will also streamline funding for more access points to the Clark Fork River and Mount Dean Stone. Oliver Gill, a recent graduate of Hellgate High School, voiced his support for the bond as an outside adventurer who grew up on the trails and is a newly registered voter. “Many of these areas are made possible by initiatives like this open space bond, and I don’t want my experience to be unique in growing up in Missoula and having this unprecedented access to these natural wonders. I want the generations to come to have the same upbringing that I had,” he said. According to Yes for Open Space, Rivers and Farmland, nearly 15,000 acres of land have been protected with the help of 10 nonprofits, governmental agencies and the 2006 open space bond. The new bond would cost the owner of a $265,000 home about $18 per year, while the maintenance levy would cost that same homeowner about $14 per year. To many at the launch, individual costs for a bond protecting a shared value are reasonable. Once land is developed, there is no turning back, and future generations cannot enjoy the space again, Stone-Manning said. “It means lost opportunity. As the old saying goes, we’re not making any more land. So if a really important parcel comes up for sale and we don’t have the ability to protect it, and it gets developed, we never get the chance. It’s done forever,” Stone-Manning said.